With our focused professional approach and well-developed manufacturing unit, we are engaged in offering the best quality Cup Brush to our esteemed clients. The offered brush is used for removal of scale, rust, and paint, as well as for deburring and polishing. This brush is manufactured using the best quality raw material and latest technology in order to meet the set industrial quality standards. Also, our quality controllers check the entire range thoroughly on various stringent parameters to ensure flawlessness. 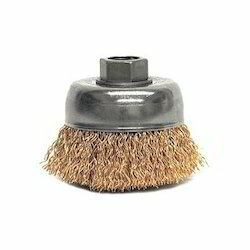 Cup Brush is designed for use in high speed air and electric tool both portable and stationary machines They are ideal for fast heavy duty cleaning of large surfaces removing weld scale rust burrs etc. Ideal for buffing, cleaning ,light deburring, flash removal surface finishing, polishing , paint & varnish removing, rest & oxide , weld preparation, weld cleaning and much more.